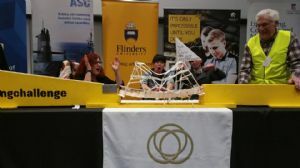 The ‘Science and Engineering Challenge’ from the University of Newcastle is coming to the Bega Valley for the first time. School students from across the region will gather at Sapphire Coast Turf Club on Friday, March 17 for a day of problem solving supported by Bega Valley Shire Council and Bega Rotary. Expert staff from Council and local engineering professionals will guide and mentor students as they explore scientific principles and solve engineering puzzles. “The aim of the day is to showcase the role science and engineering play in our everyday life as a way of encouraging kids into those careers,” said Charlie Bloomfield, President of Bega Rotary. Over the next five years, employment is predicted to increase in professional, scientific and technical services by 14 per cent. With STEM (Science, Technology, Engineering and Mathematics) graduates in Australia only making up 18 per cent of the entire graduate cohort, the Science and Engineering Challenge allows students to experience STEM in ways very different to their school classrooms. proof towers and building a bionic hand. “I am looking forward to sharing my interest and experience in these areas and inspiring the next generation of engineers, scientists, teachers and mathematicians,” said David Buckley, from Council’s Project Management team. Over 200,000 people have participated in a Challenge event since its beginnings in 2000. A recent survey of past student participants revealed that 96% found the Challenge rewarding. Photograph: Challenge participants put their ‘Paddle Pop’ stick bridge to the test.